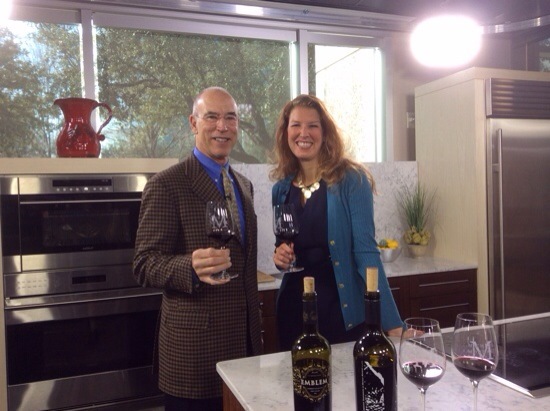 Yesterday morning I had a chance to visit the Michael Mondavi, son of the legendary Robert Mondavi, on The Broadcast. Such incredible history, but also wonderful perspective on Napa Valley and its future, for Michael Mondavi Family Wines, their future led by his children, Rob and Dina. A link to the segment is here, for notes on his Emblem Wine and M by Michael Mondavi follow the jump. 2011 Napa Valley Emblem, $35, captures both the history of the Mondavi family, as well as their story and outlook for future generations. Lush and balanced, with subtle use of oak and an approachable palate filled with black fruit and ripe red fruit, layers of spice, caramel and a hint of espresso. Predominantly Cabernet Sauvignon from hillside fruit grown in the Northern part of Napa Valley above Howell Mountain as well as valley floor fruit from Rutherford, with small percentages of Syrah, Petit Sirah, Petit Verdot, Zinfandel and Merlot added to enhance the overall character and personality of the wine, and help with its approachability, this is a great wine anytime and ready to enjoy now, or with the help of the structure in the Cabernet, can age for several years to come. 2009 M by Michael Mondavi, $200, is a bold, robust, very traditional Napa Valley Cabernet from fruit grown high atop Atlas Peak in their small production, Animo Vineyard near Krupp’s Stagecoach Vineyard with mineral rich, volcanic soil. This is what we think of when we think of great Napa Valley Cabernet, with structure, elegance and balance, filling the palate with licorice, chocolate and leather notes enhancing ripe black cherry and blackberry. A special occasion wine, and the special occasion can be that it is Tuesday night, and though it is tasting beautiful now has the easy ability to age for many years. Both wines are available at Total Wine and More stores.